Lens selection is a highly personal choice for most photographers. Your client base, shooting style, and cost all factor-in directly when you're deciding how to build a kit intelligently. 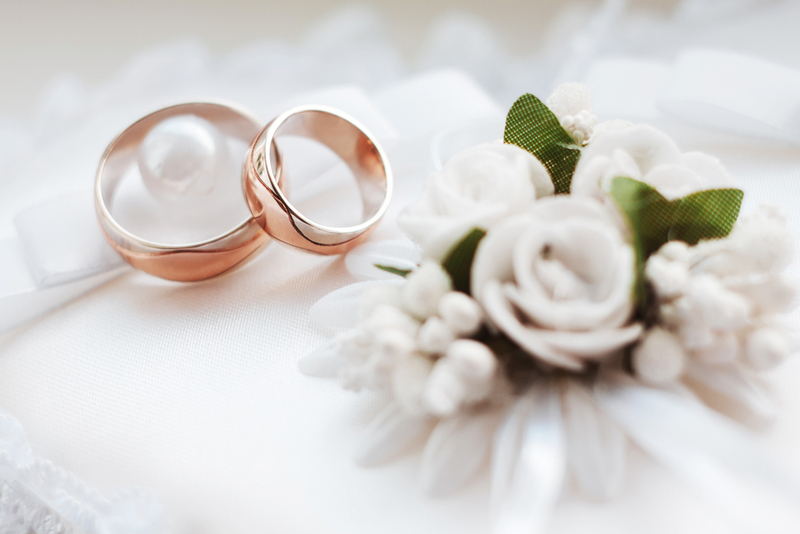 Wedding photographers need a diverse assortment, given the expectation that they must cover such a broad range of subject matter in one day’s work. As a working professional, the natural progression is to begin investing in high-quality, timelessly valuable lenses of superior durability and construction: for Canon users, this is the L-series. Marked by the tell-tale red band around the barrel of each lens, Canon’s professional L-series is renowned for its exceptional mastery over mechanical and optical design. These lenses are tough, many with rubber weather seals in place to prevent contamination from dust, dirt, or moisture. They each contain a combination of ultra or super low-dispersion glass, as well as fluorite and aspheric elements. In addition to effectively reducing unintentional distortions such as blur, haze, and chromatic aberration, these high-quality elements expertly render accurate color detail and contrast. Non-rotating front elements make it easier to adjust and use circular polarizer filters, for optimal results. Most implement a ring-type ultrasonic motor, which makes autofocus smooth and lightning fast. It also gives you the option of full-time manual focusing, which means you can still adjust manually without needing to switch out of AF mode. Superior optics make for an overall faster, sharper lens that simply outperforms many outside of the L series. While these lenses can be used with all Canon DSLR, film SLR, and the new RF-series mirrorless cameras, they do lend themselves especially well to cameras with full-frame sensors. Most professionals do shoot with full-frame DSLRs, and the exceptional sharpness at the edges of the image frame is notable, compared to lower-quality glass. A smaller sensor, such as an APS-C, will result in the apparent narrowing of your field of view. While this shouldn’t dissuade you from upgrading altogether, it is an important factor to bear in mind if you’re purchasing for a camera with a smaller than full-frame sensor. Along with its new EOS R-series mirrorless cameras, Canon also introduced a new line of RF-series lenses to complement the new camera system. Included are three L-series lenses—two zooms and a super-fast fifty. 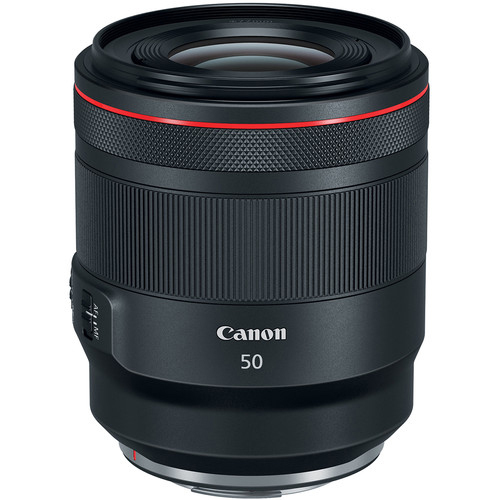 For low-light shooting and situations in which you want or require narrow depth of field, Canon has introduced the Canon RF 50mm F1.2L USM. Some of the features of this wide-aperture, weather-sealed normal lens include a customizable control ring, UD and aspheric lens elements, Air Sphere, Super Spectra, and Fluorine coatings, a 10-blade aperture, and minimum focusing distance of 15.8". 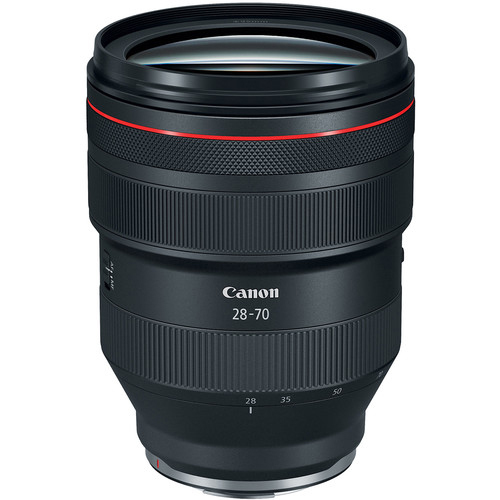 Canon has also introduced a fast zoom, the Canon RF 28-70mm F2L USM. This wide to a-wee-bit-longer-than-normal zoom features a maximum aperture that remains a bright f/2 throughout the zoom range. Other features include weather-sealed construction, a customizable control ring, UD lens elements, Air Sphere, Super Spectra, and Fluorine coatings, a 9-blade aperture, and a minimum focusing distance of 15". 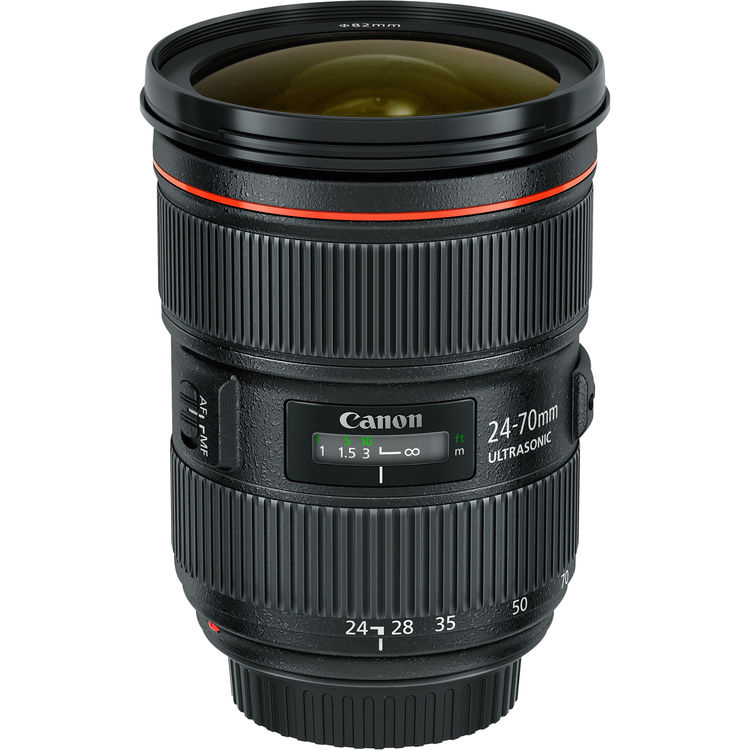 Canon’s RF 24-105mm F4L IS USM is two stops slower, but it features a 5-stop image stabilization system. It also zooms a bit wider and longer than the abovementioned 28-70mm f/2 zoom. Some of the advanced features of this lens include a customizable control ring, UD and aspheric lens elements, Air Sphere, Super Spectra, and Fluorine coatings, a 9-blade aperture, and a minimum focusing distance of 17.7". Fulfilling the role as the all-purpose workhorse, a standard zoom is versatile enough to handle nearly the entire job. Its variance in some of the most commonly used focal lengths makes it the perfect walk-around lens for a ceremony or reception venue, able to cover broad vistas and intimate portraiture. If you’ve yet to upgrade to any L-series lens, consider making the ever-useful standard zoom your first investment. 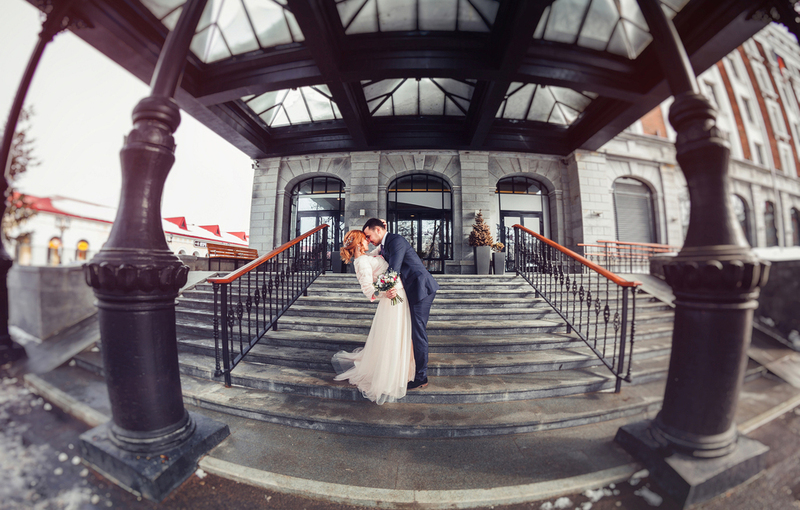 The 24-70mm is often hailed as the most popular choice for a variety of photography professionals, including wedding shooters. 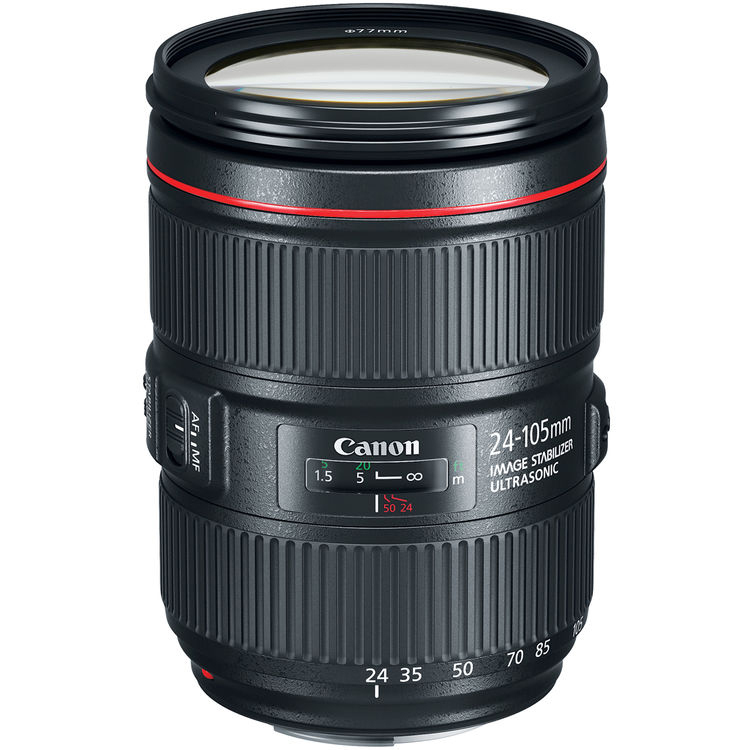 Canon offers two L-series interpretations of this lens, the EF 24-70mm f/2.8L II USM, and newer EF 24-70mm f/4L IS USM. While appearing similar in title, the two share little apart from focal length, angle of view (84° – 34°), and minimum focusing distance of 1.25'. They also both offer a zoom lock mechanism that prevents your lens from creeping when it’s at its most compact, as well as nine circular aperture blades. The EF 24-70mm f/4L boasts a Macro Mode, which can be switched on at the end of the 70mm zoom range. While this doesn’t equate to full 1:1, it comes incredibly close at 0.70x magnification. Here, Canon also implements its Hybrid Image Stabilization system, which provides up to four stops of shutter speed compensation when shooting up close. The EF 24-70mm f/2.8L II is a faster lens, given its maximum aperture of f/2.8, which could be incredibly helpful for working in a variety of environments and scenes. It does not offer any Image Stabilization, but still produces a razor-sharp final image. While the EF 24-70mm f/4L utilizes two super UD elements, the EF 24-70mm f/2.8L II has one. The latter is also a slightly larger lens, heavier and almost an inch longer. It also requires an 82mm filter, whereas the f/4L’s filter thread measures 77mm. If you need an option with a longer focal-length range, the new EF 24-105mm f/4L IS II USM covers wide angle through medium telephoto. A great lens for professionals and amateurs alike, it lends itself well to handheld shooting and has a longer reach than the previous options. Image Stabilization works to reduce increased image blur at shutter speeds up to four stops slower. It’s also lightweight, weighing 1.75 lb and measuring a bit more than 4.5" in length, which makes it easy to carry and balance. A constant maximum aperture lets you set your exposure at the widest f-stop and zoom through to 105mm without ever needing to slow the shutter speed. 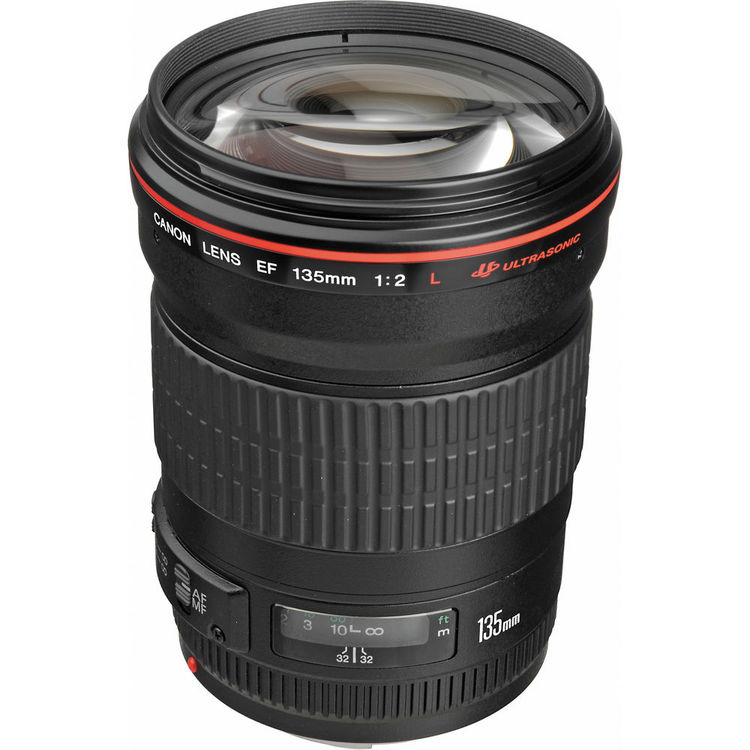 Its minimum focusing distance is 1.48' and, like the EF 24-70mm f/4L, it accepts a 77mm filter. A fast, dedicated macro is the obvious go-to lens for capturing the details in flowers, decorations, the cake, and the rings. With a life-size magnification ratio of 1:1, the mid-telephoto Canon EF 100mm f/2.8L Macro IS USM is a sophisticated update from Canon’s previously comparable macro. Now an esteemed member of the L-series lineup, the EF 100mm f/2.8L offers a fluid Ultrasonic focus motor and Hybrid Optical Image Stabilization Technology for up to 4 stops of stabilization. The comfortable amount of space allowed between the camera and subject gives you the freedom to compose with less instance of shadow interference, and minimum focusing distance is close as 1'. This lens is tack sharp, and with a maximum aperture of f/2.8, holds its own in low light. 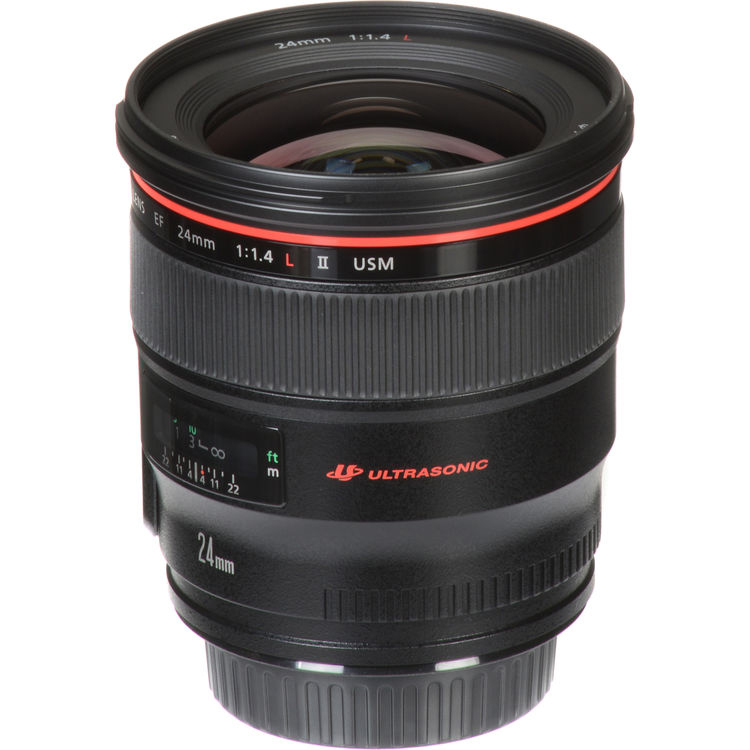 Its favorable focal length gives you the added option of doubling its use, as a portrait lens. The EF 100mm f/2.8L can be fitted with a 67mm filter of your choice or optional tripod collar. It's also compatible with several Canon extension tubes, which increase magnification for some extraordinary close-up shots. One of the most obvious requirements for a wedding photographer is shooting portraiture, both formal and casual in nature. A prime medium telephoto, such as the EF 85mm f/1.2L II USM, is the go-to lens for portraits. One of the fastest lenses in its class, with a maximum aperture of f/1.2, it gives you the freedom to tackle low-light shooting without noise overpowering your images. The wide, eight-bladed circular diaphragm also creates super-shallow depth of field. Selective focus can be used to create dynamic, professional portraits with smoothly blurred backgrounds. A focal length of 85mm is slightly longer in perspective than the human eye sees naturally, flattening and complimenting the subject’s features without distortion. The 85mm f/1.2L II does not offer Image Stabilization, but its speed and lightweight frame make camera shake less of an issue. Its minimum focusing distance is 3.12', and encompasses a 28-degree angle of view. It also takes a 72mm filter. For a bit longer reach, and even greater visual compression, the EF 135mm f/2L USM is a viable option for portraiture and working with other subjects from a comfortable distance. The f/2 maximum aperture is effective for working in low-light conditions and, paired with the eight-blade diaphragm, also helps to realize a smooth out-of-focus quality in selective-focus imagery. The USM focusing motor produces smooth and consistently accurate AF performance and an integrated focus range limiter helps to speed up focus when working with subjects farther than 5.2' away. The optical design of the EF 135mm f/2L USM incorporates two UD elements to reduce chromatic aberrations and produce sharp, clear imagery. Its minimum focusing distance is 3' and it will accept 72mm filters. The telephoto zoom is another valuable addition to the wedding professional’s kit. The EF 70-200mm f/2.8L IS II USM is a popular choice that offers multiple areas of coverage, including portraiture. A longer focal length creates the perception of a narrowed field of view, which results in very shallow depth of field, especially at wider apertures. This can be an effective way to shoot portraits with cluttered backgrounds. By controlling blur to your advantage, you can eliminate distracting surroundings. The telephoto lens also captures subjects from farther away, which is a necessity at a larger venue. Additionally, it allows you to keep a respectful distance so as not to intrude on intimate moments. If you have access to balconies or ladders, you can achieve some creative results by taking advantage of different shooting angles. 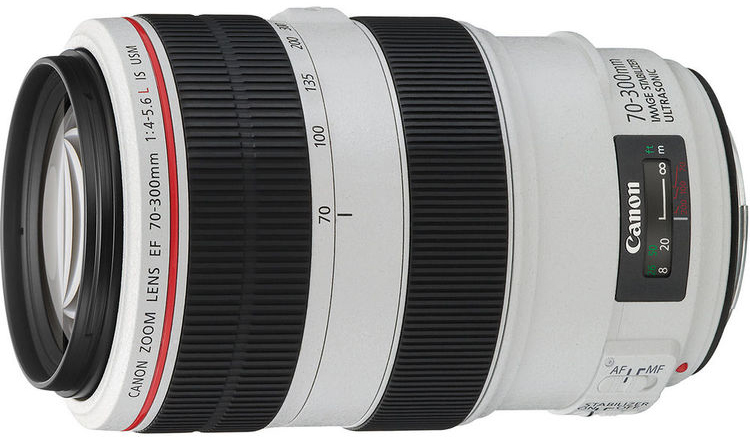 Canon continues to improve upon its lineup of quality 70-200mm zoom lenses. As its Roman-numerically anointed name suggests, Canon’s EF 70-200mm f/2.8L IS III USM is the third update of Canon’s highly-regarded 70-200mm f/2.8 zoom-series lenses. The latest incarnate of this fixed-aperture heavy-hitter measures a mere 7.8" long, weighs an easily manageable 3.26 lb, and contains 23 elements in 19 groups, including a single fluorite and 5 UD elements that help suppress color fringing and chromatic aberrations. To reduce incidents of flare and ghosting, the new zoom also features Canon’s latest Air Sphere Coatings (ASC). Other features of this lens include a focus limiter switch, and a minimum focus distance of 3.94' (0.21x). The 70-200mm f/2.8L IS III USM accepts 77mm filters. If you prefer a comparable lens that’s slightly smaller, lighter, and you can live with a maximum aperture of f/4, Canon has also introduced the EF 70-200mm f/4L IS II USM, which is 6.9" long, weighs 1.7 lb, and is every bit as sharp as its one-stop-faster sibling. Canon’s 70-200mm f/2.8L IS II USM and the EF 70-200mm f/2.8L USM, without image stabilization; the lighter weight and more compact EF 70-200mm f/4L USM; and the f/4 version with image stabilization, the EF 70-200mm f/4L IS USM, remain in Canon’s roster of high-performance 70-200mm zoom lenses. And for those looking for a bit more reach while maintaining the classic 70mm wide position, Canon also offers the EF 70-300mm f/4-5.6L IS USM. There is a benefit to owning several prime lenses. Primes have fixed focal lengths, which simplifies and maximizes their optical design. Their incredible speed makes them perfect for handling difficult lighting at an acceptable ISO. In a dimly lit reception venue, these can be ideal for walking around and shooting candid portraits of the bridal party and guests. A super-shallow depth of field can soften a chaotic background, making your subjects the central focus of the photo. 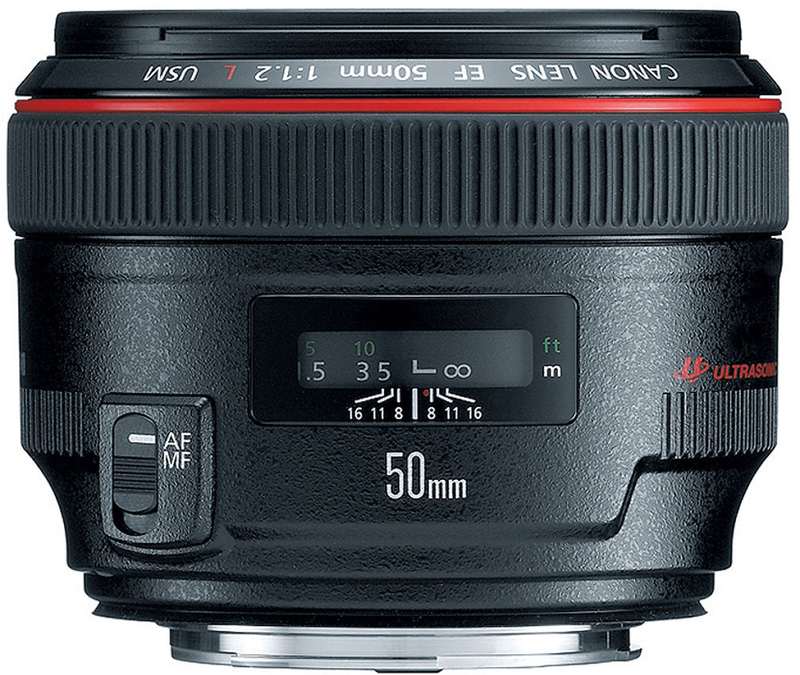 The EF 50mm f/1.2L USM is a standard-length lens with a 46-degree angle of view. 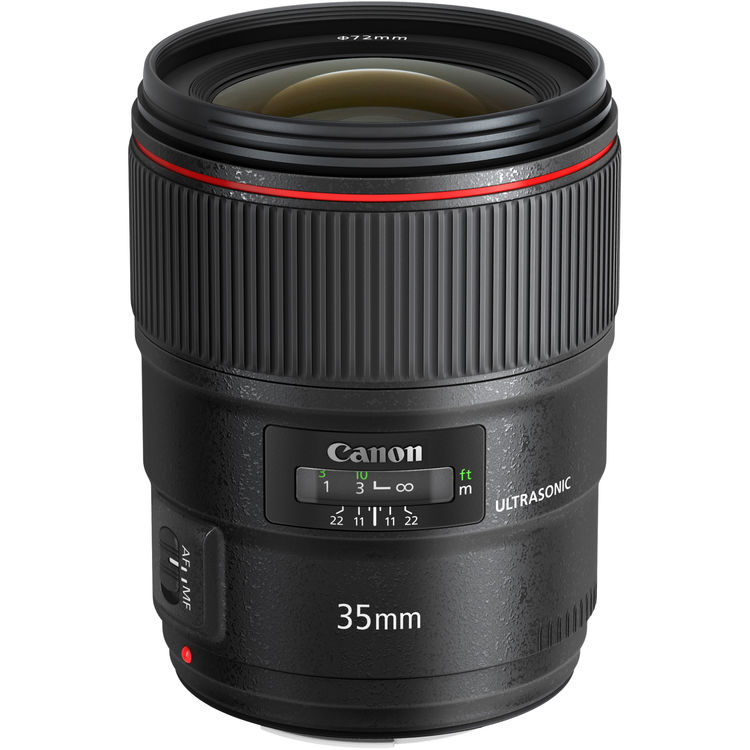 For something slightly wider, the recently released EF 35mm f/1.4L II USM offers a 63-degree angle of view and features a large maximum aperture for its class. It will focus as close as 11", while the 50mm f/1.2L needs an extra seven inches. Both lenses are similar in weight and dimension (the 35mm f/1.4L being almost an inch and a half longer), and both accept 72mm filters. 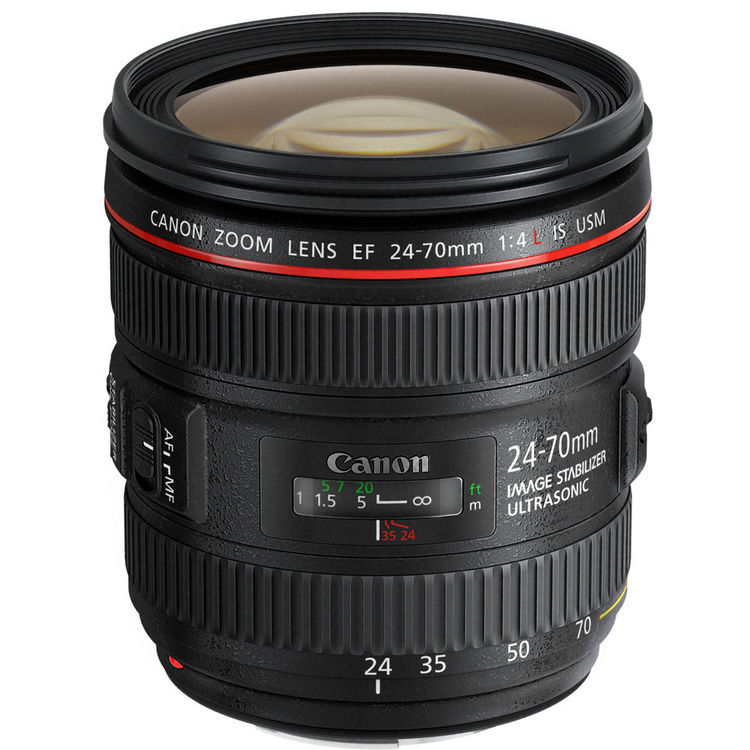 For an even broader perspective, the EF 24mm f/1.4L II USM maintains a similar fast maximum aperture and sophisticated optical design, which incorporates two aspherical elements and two Ultra Low Dispersion elements. When combined with the aforementioned 85mm f/1.2, this quartet of fast primes is the standard kit to hit the key perspectives for a wide range of shooting applications. The consistency in maximum apertures and robust build quality also make switching between focal lengths nearly as seamless as working with a zoom, but with the added speed benefits and optical quality inherent to prime lenses. To encompass a broader field of view, you will need a wide-angle lens. 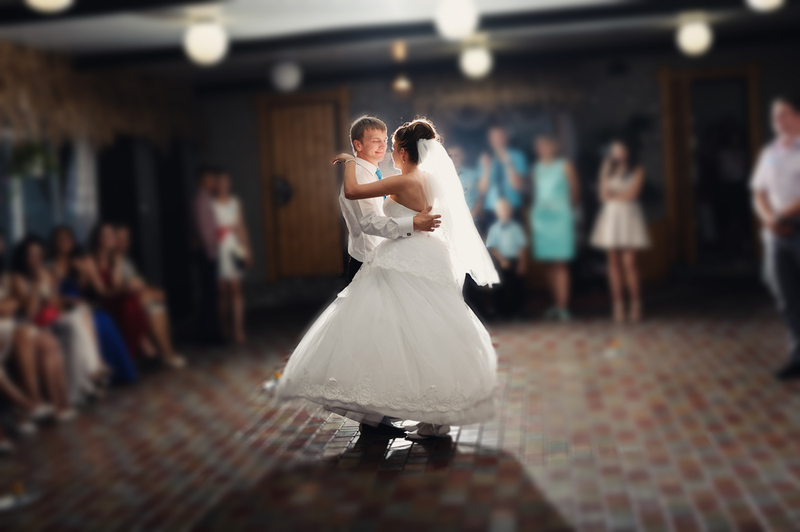 Super-wides are a necessity in tackling group portraits, and offer a great perspective for dancing guests. They’re also invaluable for documenting the architectural elements of venues. Short focal lengths offer an immersive point of view that puts the observer amid the action, a key element in visual storytelling. Canon offers several L-series choices in the wide-angle category. 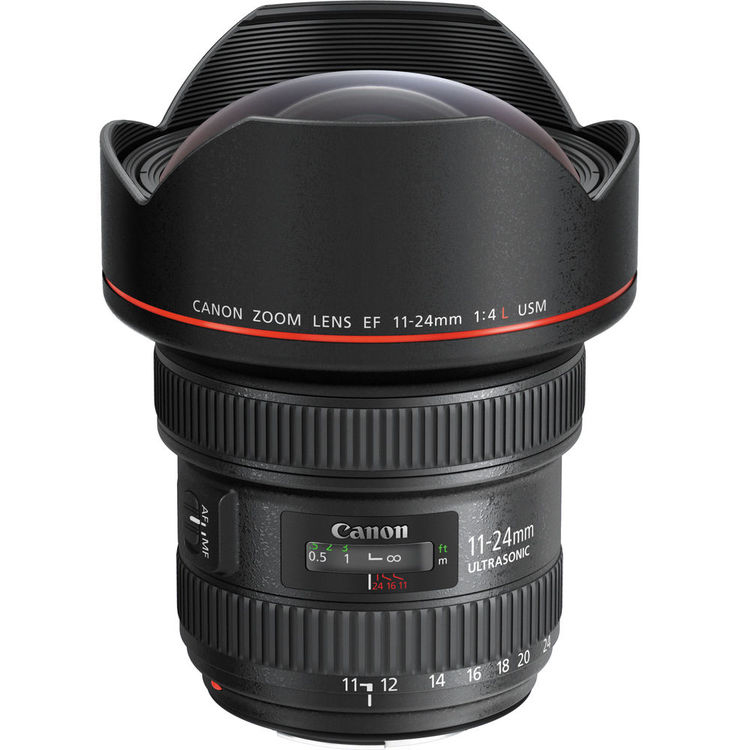 The EF 11-24mm f/4L USM has the distinction of being the widest rectilinear full-frame lens available for Canon shooters, and has the added benefit of a constant f/4 maximum aperture for greater consistency when working in low-light conditions. A mixture of Super UD, UD, and four aspherical elements control aberrations and distortions, and SWC and ASC coatings help to prevent lens flare that is common to such wide-angle lenses. The EF 14mm f/2.8L II USM is another very wide offering; however, this time it’s a prime-lens design. It offers a 114-degree angle of view, which is just shy of being a fisheye. A fixed petal-shaped hood protects the protruding glass, and a gelatin filter holder is accessible in the rear of the lens. The EF 16-35mm f/2.8L III USM updates the EF 16-35mm f/2.8L II USM and is an ultra-wide zoom option, with optical elements to ensure edge-to-edge image quality. Its angle of view ranges from 108° to 63°, and it can focus as close as 11". 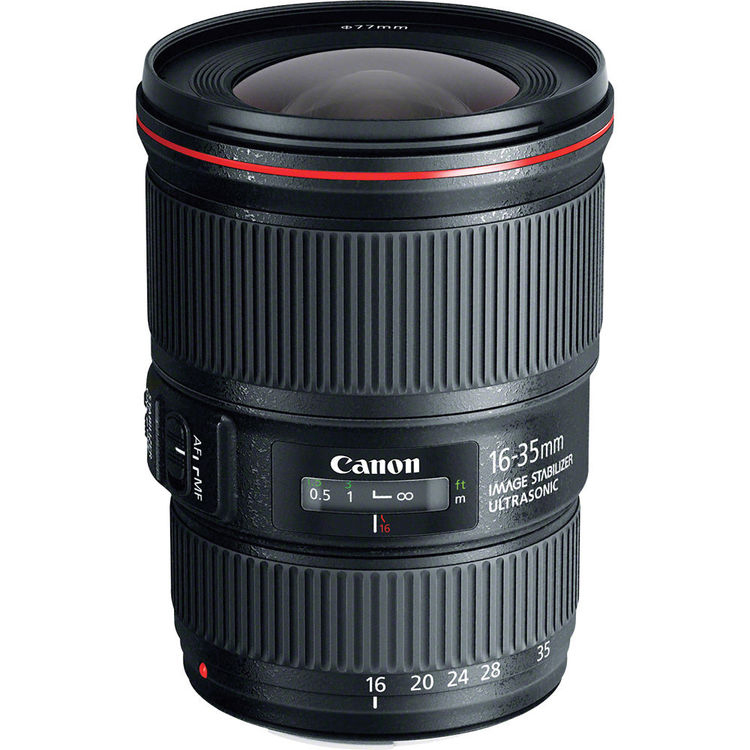 Sacrificing a bit of the speed, but gaining image stabilization, there is also the EF 16-35mm f/4L IS USM option. 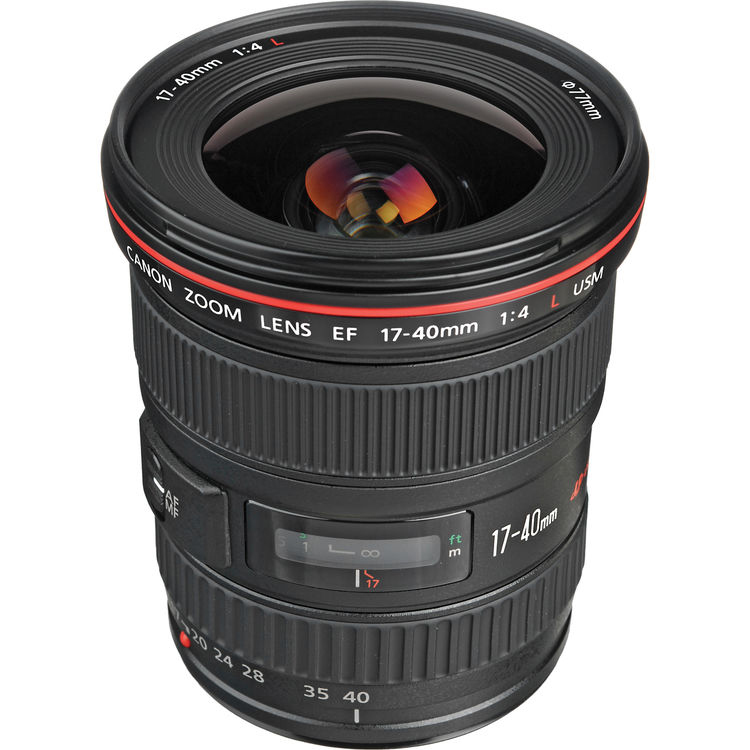 The slightly longer EF 17-40mm f/4L USM encompasses a 104- to 57-degree angle of view, and also focuses at 11" from its subject. While it accepts a 77mm filter, you have the option of using a rear gelatin filter holder as well. 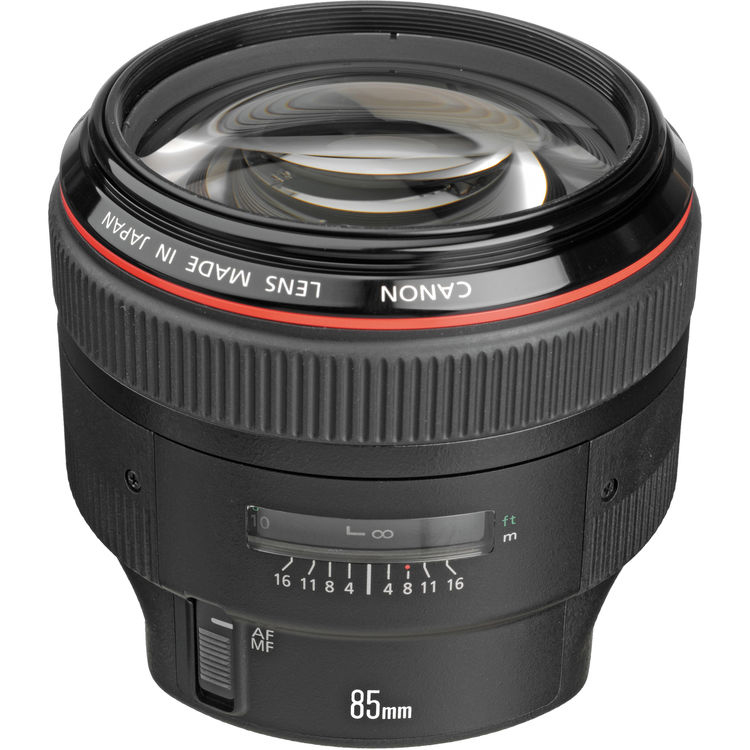 The 16-35mm f/2.8L II requires an 82mm filter. All four of these lenses have elements in place that reduce many of the chromatic aberrations that plague an image at a wider angle, such as vignetting and color bleed. Able to capture 180° of view, the Canon EF 8-15mm f/4L Fisheye USM offers an alternative “big picture” perspective, for an element of fun. On a full-frame camera body, it delivers circular and full-frame fisheye images, depending on what range of zoom you use. Keep in mind if you shoot with a cropped-sensor camera, some field of view will be lost. However, a zoom lock mechanism limits focal-length range to the best possible full-frame view to avoid unwanted vignetting for APS-C or APS-H. A holder in the rear of lens will hold up to three pre-cut gelatin filters, and a sub-wavelength coating on its glass works to reduce image ghosting. 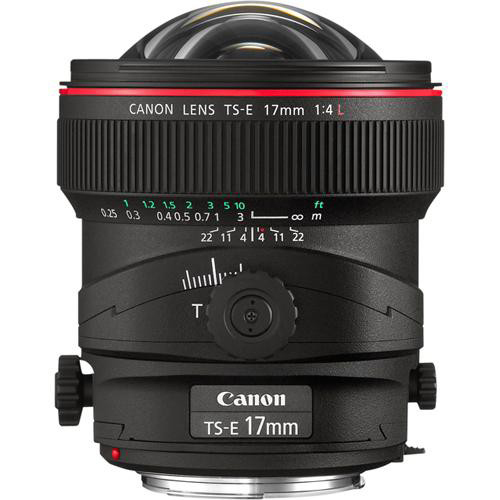 Another pair of specialized optics are the TS-E 17mm f/4L and TS-E 24mm f/3.5L II Tilt-Shift lenses. Being members of the L series, they benefit from all the advanced optics and durable construction found in top-tier glass, but add the ability to control perspective through tilt and shift movements. These lenses will help photographers correct for things such as keystoning and working in tight spaces and are handy wide options for capturing the venue. Additionally, while they are manual focus only, they benefit from full electronic control and communication with EOS series bodies. For more information, please stop by the B&H SuperStore in New York, or contact a sales professional over the phone at 1-800-606-6969 or online via Live Chat. Which Canon L-series lenses do you favor for photographing weddings and social events? Tell us all about it in the Comments section, below. Less is more. On full frame, a 35/1.4 and 100 Macro would pair very well and cover almost everything. Perhaps swap out the macro for the 85/1.2 (or the excellent and cheap 85/1.8 to save weight and money) and you still get almost everything in just two fast primes. Maybe, just maybe stick the 50/1.8 STM in a pocket, just in case. Us Leica rangefinder photographers have been shooting this way for years. So that we may provide you with a more focused recommendation, can you please indicate which specific model Canon camera you'd like a lens recommendation for? Thank you in advance. hello allison i have a 24-105mm F4 that i use with my 7D MKII..This is a very versitile lens that works well even in low light..it is a bit heavier than standard kit lenses but the difference in quality make this a lens worth having..try one at camera shop sometime..you will see what i mean..GOOD LUCK...HOPE THIS HELPS... T E R R Y.. Thanks for helping a fellow B&H customer, TERRY! I have a rebel T3, but want better quality . I use a 75-300 kit lens and usually shot birds and other nature shots (sunsets, bodies of water, ect). Would it be better to invest in a Lens that is a better quality lens or a higher grade camera, or both? Thanks ! I would suggest looking into a new lens first. Especially if you shoot birds, something with more reach could really help in getting the photos you want. You might look at the Sigma 150-500mm lens. It is an extremely popular option for nature/bird photography, and would be a step up from your current lens. I need an input for 70-300mm f/4-5.6 USM lens. Could you recommend any of the above for use with the Sony A7 Emount camera? To use any of the Canon L lenses with the Sony a7, you will need a lens adapter. I would suggest looking at the Metabones Canon EF Lens to Sony NEX Camera Lens Mount Adapter III. It is one of the few adapters on the market that will allow you to control Canon lens’s apertures on Sony E-mount cameras. As for which lens to use, that would depend on what you are looking to shoot. I am a new Canon camera owner and am trying to learn as much as I can to take better photographs. 1. Typo in Portrait Lenses: f/2.1L should be f/1.2L. 2. Many of these articles are written from the point of view of "experts who've been working for 20 years with all the Canon lenses". In this case, (I think) you should be writing to the audience of someone planning or wanting to buy a lens. Read the section on "Standard Zoom Lenses". Reads like a catalog, right? Each detail in those paragraphs is something I would just as easily get from the catalog page, and that's fine, but not helpful to _me_. I want to know which of the three zoom lenses in this section addresses _my_ problem. Which lens excels in which situation? Look at your article - all the lenses are "great"; ok, this one has IS, but that one is f/2.8... And the cheapest of the three has the widest zoom range. Why isn't that just automatically the best? Why spend an extra $250 and go from 24-105mm down to 24-70mm? So, what should _I_ do? -- a "Normal 50 mm f/1.2 lens" for $1600. I don't think anyone would call the 1.8 "fast" if they are also looking at the 1.4, never mind the 1.2. But, I know which looks more attractive (especially if I don't know any better - e.g., looking for a gift). To be useful to me, as someone willing to plunk down a few grand (but unwilling to lug around the whole set), I want to know which one(s) meet my need(s), solve my problem(s). Aside from price, how do I differentiate between the lenses? When should I plunk down $2100 vs. $1200? I'm happy to lay out $2K as long as I understand why it will work better in my situation. Your section on Portraiture was better - I actually came away understanding which lens, and why (and, in fact, why I might really want both, and maybe a new body to avoid having to switch :-). Remember, your audience _wants_ to buy something. That's why they're here. All these lenses will take great pictures, and these truly are the cream of the crop. Now, put hyperbole and rhetoric aside and help me choose which one(s) I want, in particular. As somone who shoots a TON of low light action photography from wedding to contemporary dance, the 24-70 f2.8L is THE go-to lens in my kit, and the one I could not do without. I also have a 16-35 f2.8 which is amazing and razor sharp which I use for everything from real estate to weddings (video and photo) and a 70-200 f4 which is much lighter than the f2.8 but without the IS and not as good for portraiture but wonderful in most of my shooting situations and well worth the lower price for me. The 85 mm f1.2 is absolutely amazing on a full frame but I would probably not choose it for an APS-C sensor. It's razor sharp and has gorgeous bokeh. I also regularly use a 50 mm f1.4 and 35mm f2.0 IS, neither of which are L series and there is a big difference in optics. The non-L series glass is great for amateur gigs and personal projects, but I never use it on pro gigs, it just doesn't have anywhere near the same quality. Thank you for your insightful comments and suggestions! Spot on - great feedback! Surprised to see no mention of the extraordinary 24mm f/1.4 L! 135mm f/2.0L is the lord of the red lens.